Just announced are The Toy Industry Association‘s finalists for the coveted 2017 Toy of the Year. 14 categories of finalists have been chosen from over 700 nominees by a pool of 25 judges including toy and play experts, retailers, academics and journalists. The winners will be revealed at a special industry event on February 17, 2017, to be held on the Intrepid Air and Space Museum in NYC. The winning line-up is traditionally displayed at the annual New York Toy Fair also held in February. See links to our past coverage below. In the meantime Adrianna and I are thrilled to see so many of our personal favorites on the list. We’re also very happy to see an Action Figure of the Year category has been added to the mix. We congratulate all the creators and companies honored. You can cast your own vote in the “People’s Choice” award via this Toy Awards link. This is a consumer only component and is attached to a Toy of the Year Sweepstakes. Voting is open until January 15, 2017. Finalists in the new Toy Industry Association Awards “Action Figure of the Year” category. 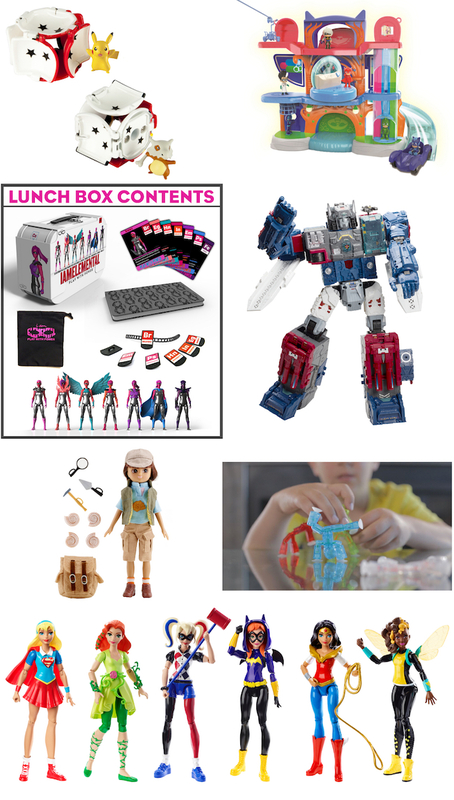 * DC Super Hero Girls™ Action Figure Assortment by Mattel, Inc.
* Fossil Hunter Lottie by Arklu, Ltd.
* Transformers Generations Titans Return Fortress Maximus Action Figure by Hasbro, Inc.
* Air Hogs Helix Sentinel Drone by Spin Master Ltd.
* Hot Wheels® Sky Shock™ RC Vehicle by Mattel, Inc.
* Nerf N-Strike Modulus Tri-Strike Blaster by Hasbro, Inc.
Toys that compose a set; can include novelty playthings, miniature versions of existing lines, licensed collectibles, etc. * LEGO Minifigures – The Disney Edition by LEGO Systems, Inc.
* Grippies® Builders by Guidecraft USA Inc.
* LEGO Friends Amusement Park Roller Coaster by LEGO Systems, Inc.
* Meccano Micronoid by Spin Master Ltd.
* Barbie® Fashionista™ Doll by Mattel, Inc.
* Elena of Avalor Adventure Dress Doll by Hasbro, Inc.
* WellieWishers™ by Mattel, Inc.
* Bloxels™ by Mattel, Inc.
* Circuit Maze by ThinkFun Inc.
* Escape Room the Game by Spin Master Ltd.
* Simon Air Game by Hasbro, Inc.
* Speak Out by Hasbro, Inc.
* Yeti in My Spaghetti by PlayMonster! * IO Blocks® Vehicles by Guidecraft USA Inc.
* Zoomer Marshall by Spin Master Ltd.
* CHiP by WowWee USA, Inc.
* Fisher Price® Think & Learn Code-a-pillar™ by Mattel, Inc.
* Hatchimals by Spin Master Ltd.
* Automoblox C9 Sportscar by PlayMonster! * LEGO Disney Castle by LEGO Systems, Inc.
* Melody™ Doll and Book by Mattel, Inc.
* Perplexus Q-bot by PlayMonster! * Air Hogs Connect: Mission Drone by Spin Master Ltd.
* LUMI by WowWee USA, Inc.
* Zoomer Chimp by Spin Master Ltd.
* Hot Wheels® A.I. Intelligent Race System by Mattel, Inc.
* LEGO Technic Porsche 911 GT3RS by LEGO Systems, Inc.
OMG Skeleton Pete I pretty much want a few of these things and am going to see if I am too old to have a Santa list. Such a great time to be in the younger set with all of these awesome offerings. I made my own picks for the TOTY and hope we can compare notes sometime in the future. Get out and vote people, the future of positive play is at stake here! You are never too old to be on Santa’s list, but post your People’s Choice vote and you might be a lucky TotY Sweepstakes winner.